Factory bills at catalog prices unless a written quote from the factory accompanies the order. To receive a quote on a custom item not appearing in our catalog please call, e-mail or fax our customer service department with product information such as size, custom image, printing requests, etc. Standard production time for most items is 5-7 working days. Production begins the day AFTER receipt of order with artwork & credit approval. If credit has not been established, production will start after receipt of payment. Rush service is available on most items. In accordance with printing industry standards, all orders are subject to a 5% over or under run and will billed accordingly. Manufacturing exact quantity will incur a 4% upcharge. Prices and specifications in the catalog are subject to change without notice. Prices are effective immediately. All prices are F.O.B. from our factory in Chicago, Illinois 60629. Lion Circle is not responsible for incorrect or non-current pricing for items listed or shown on third-party publications or media including websites and search engines (such as ESP, SAGE, etc.). Please contact us for the most complete & current information or visit www.lioncircle.com. • Reorders should reference previous PO and date (no plate charges for exact repeats) within 2 years. Artwork can be E-mailed to: art@lioncircle.com or uploaded to our website at lioncircle.com under Distributor Tools. Artwork can also be sent on CD or DVD. FTP access is also available upon request. All files containing artwork should be compressed in WinZip® or StuffIt® before sending. See next pag for detailed art requirements. Call factory if there are any questions. Net 30 days, subject to satisfactory credit approval. After 60 days a 12% service charge per month will be added to the balance owed. Foreign transactions - checks must state “Payable in U.S. Dollars”. NSF checks have a handling charge of $30.00. All orders will be acknowledged via e-mail or fax. Please review acknowledgment upon receipt and notify factory immediately if there is a discrepancy. All orders will be processed and billed based on the information that appears on the acknowledgment, subject to any changes received in writing. Factory will supply a Fax or E-mail Proof for all orders at no charge. If changes are required, an additional art charge may apply. Proof approval must be in writing within 24 hours or production delay may occur. CANCELLATIONS Any orders cancelled during production will be charged a $35.00(z) cancellation fee plus any charges incurred to date of cancellation. Factory ships all items bulk, unless otherwise specified. Please call factory for quote on any special packaging requirements. All products F.O.B. from our Factory in Chicago, Illinois 60629. Orders will be shipped the most economical and efficient way unless otherwise specified.Delivery liability with factory ends when merchandise is released to a freight carrier. If for whatever reason the carrier fails to make a timely delivery, the distributor still has a liability to the factory. International orders incur an additional $15.00(z) documentation fee. Any changes to shipping addresses must be in writing one business day prior to shipping date or the order may be delayed upon shipping. A handling charge of $10.00(z) will apply to all orders shipped using customer’s carrier number. Please refer to website as handling charge may change if carriers’ prices increase. Add $5.00(z) for each additional destination to cover additional handling. All split shipments must be shipped at the same time or additional charges may be incurred. Please refer to website as handling charge may change if carriers’ prices increase. Available at no charge upon request when added to your imprint. Unless indicated on purchase order or in writing, the factory reserves the right to use any item produced in displays, catalogs, flyers, advertisements and other promotional uses. Most of our products meet current Federal Safety Standards. Call us for test or compliance questions. Products used by children under 12 are required by Consumer Product Safety Improvement Act (CPSIA), to be marked with tracking information including our company name, city, state and job number. (i.e. Lion Circle, Chicago, IL 3501234). Any product with elastic bands will also include the WARNING LABEL shown. Paper and magnet thickness may have up to .001 differential. • Before affixing magnetic sheet to a metal surface, be sure all surface paints, clear coats and waxes are cured (hardened). • Clean the metallic surface and the magnet with mild detergent, wipe with soft cloth. • Affix to smooth, flat or gently curved metallic surfaces. • Make sure the entire magnet is flat against the metal surface (i.e., no air pockets). • If you place the magnet in the wrong position, completely remove the magnet from the surface and re affix. Do not pull the magnet across the surface, or it may stretch due to the resistance caused by the high magnetic strength. • Avoid use on horizontal metal surfaces exposed to direct sunlight (such as automobile hoods) or temperatures exceeding 150°F (66°C). • Be aware that long-term use on surfaces frequently exposed to sunlight (such as vehicles) can result in uneven fading of the surface because the magnet-covered area is shielded from ultraviolet rays. • To protect fresh clear coat, base coat and/or vinyl surfaces on new cars and trucks, remove magnetic signs DAILY. Preferred art is Vector based saved as EPS format. Art should be modeled in the desired spot colors unless product is to be printed in four-color process. *Color Photoshop files must be saved in CMYK mode. Black and white photographs should be saved in GRAYSCALE mode. Resolution should be 300 dpi at 100% of printing size and saved as EPS, TIFF, PSD or JPEG format. Black and white line art should be saved in BITMAP mode at no less than 600 dpi resolution at 100% of print size and saved as EPS. All photos and links must accompany the files they are used in, no embedded photos please. DO NOT send in Corel Draw (.cdr), Word (.doc), Excel (.xlsx) or Publisher (.pub) files for artwork. These types of files are either non-acceptable artwork formats or they are unreliable when converting to Adobe graphics software and could produce undesirable effects which could delay the production of your order. Please save or export art as Press-Quality PDF. If you submit art as a TIFF or JPEG, please remove the die, margin and guide lines before rasterizing the image. 300 dpi is the minimum recommendation. All fonts must be included with all documents. If generated on a PC platform, all text MUST be converted to paths. There will be no art charge if acceptable computer-generated art is provided. Preparation of artwork that is not computer generated to our specifications will be subject to a charge of $50.00(z) per hour. Minimum charge is 1 hour. Templates for most products will be available at www.lioncircle.com. Please contact Lion Circle for templates. available. Due to the printing process there is a tolerance of ± 2.9 mm in the printing registration. Borders are not available on digitally printed products. Digital virtual samples are provided with all orders at no charge. 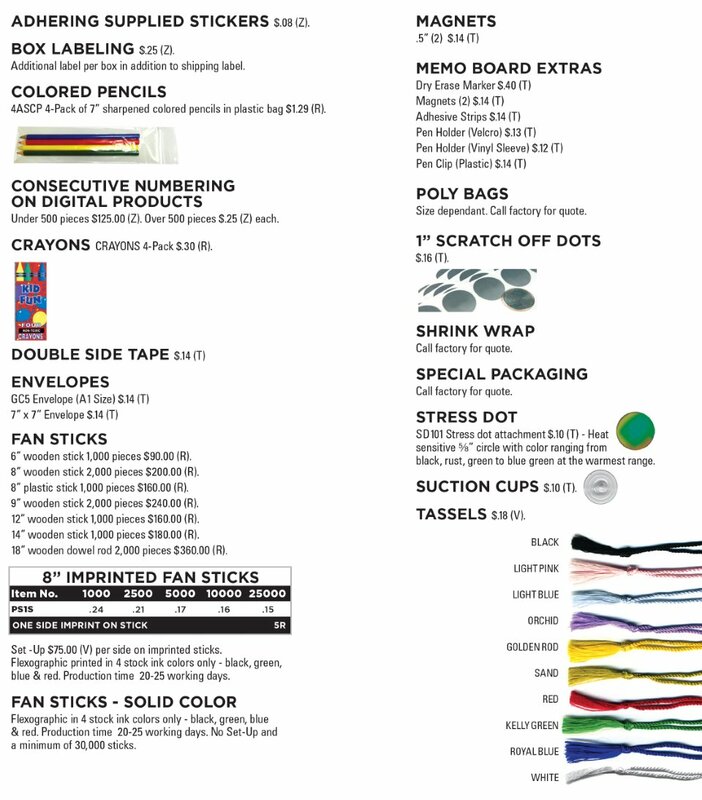 Digitally printed spec samples are $75.00(z). Offset printed spec samples, please call factory for quote. Call factory for quote and minimums. Exact color match available at additional charge. PMS Color Match is $15.00(V) per color; Outdoor Magnets, Plastic Items & Repositionable Stickers are $35.00 (z). Refer to Pantone Solid Coated and Uncoated Formula Guides. To avoid this charge, please select from our standard colors listed below. Fluorescent and metallic inks are only available for offset printed paper products. Not available on plastic, magnetic or digital printed items.